My stepdaughter is home from school today with a yucky cough and on again, off again fever, so here are two brief reviews which make for an interesting compare and contrast. Winter’s Bone, by Daniel Woodrell, is the story of Ree, a sixteen year old girl who lives in the Ozarks in the middle of a booming cottage methamphetamine industry. The movie based upon this book is nominated for four Oscars, but I have not seen it yet. Ree’s father has disappeared and if she doesn’t find him, she’ll lose the house where she takes care of her mentally disturbed (or just mentally fatigued) mother and two brothers. My friend who lent me this book wanted to talk about the voice. The story is interesting, in that I have to say I wasn’t completely aware of the meth epidemic in the Ozarks. I live in a fairly rural area, and I certainly know there’s a booming meth business here, but I guess the thought just hadn’t occurred to me that it’d be in the hills of Arkansas and Missouri, as well. But my friend’s right in that what’s more interesting about the novel is the voice, and the way the voice so nicely evokes place. There’s a lot that’s literally not said in the novel between characters, and the gaps actually say a lot. You won’t find paragraphs full of description of houses or landscape, and yet you still get a real feel for the world you’re traveling. The characters in this novel are exactly what many folks would consider hillbillies or white trash, and yet any judgement or awareness of what their lives might look like to outsiders is almost completely absent. So what’s interesting about this novel is that it says so much in what it doesn’t say. Novel About My Wife, on the other hand, says a lot. The first person narrator goes on, and on, and on. He’s a husband and father living in London whose wife is dead, though we don’t know how until the end. The novel is flashback on events leading up to her death and the mysterious stranger whom she believed was stalking her. 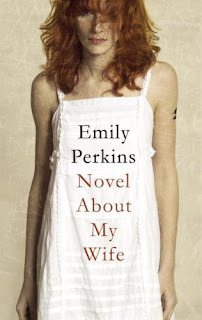 The author, Emily Perkins, is a woman, but the narrator is male, and I have to say, really unlikable for me. He’s supposed to be married, but his experience of what it means to be married is really nothing like mine. Probably because he barely knows his wife, which becomes pretty important to the story. Perhaps it was Perkins’ intent that we not like the narrator and she’s trying to say something about husbands’ relationships to their wives (hence, the title). And perhaps in this novel, the incessant talking and thinking, and thinking and talking which the narrator engages in is representative of what his world is like. It’s the world of London for the hip and young, and I admit, I know nothing about that world, not being a big city person, or particularly young or hip. Both novels portray worlds peopled with characters who are not always particularly caring or kind to each other. I found that easier to handle in Winter’s Bone, because these are poor, hard scrabble folks in the mountains. They do the best they can and they have their own set of rules to live by. It makes sense that there’s a lot of tough love going on, and sometimes just some outright cruelty. It’s interesting to think about how that parallels the world of fairly affluent folks in London. What’s their excuse for being so crappy to each other? Between the two, I much preferred Winter’s Bone. I think it takes some impressive skill to make silence speak, and Woodrell does this very well. I like what you said about making “silence speak”…Winter's Bone was very much like that. You should see the film if you are able, I think they did a very good job at capturing the book (although I read it after seeing the film). Thanks, Melody. The film is on my list, but it's easier for me sometimes to read a book than it is to get out and see a movie. I think this one is already on Netflix, thouh. Thank you so much for this well-written and engaging review: I'll echo what others have noted, that this tandem review works quite well, esp. when you contrast the two novels. I'm on the hop too this time: I'd love your opinion, Robyn. Laurie, thanks for hopping by. Hope you enjoy Winter's Bone, and glad I stumbled upon something that seems to work (pairing two books). Maybe I'll follow your lead and start a new duo book review feature. 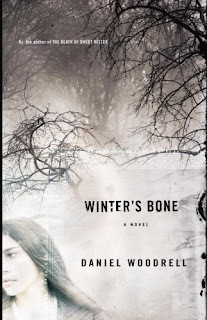 I read Winter's Bone after watching the movie, and I have to say I think the movie was better than the book, although the book was very, very good too. It was very understated, but sometimes that's what you need in a book where not everything is said.